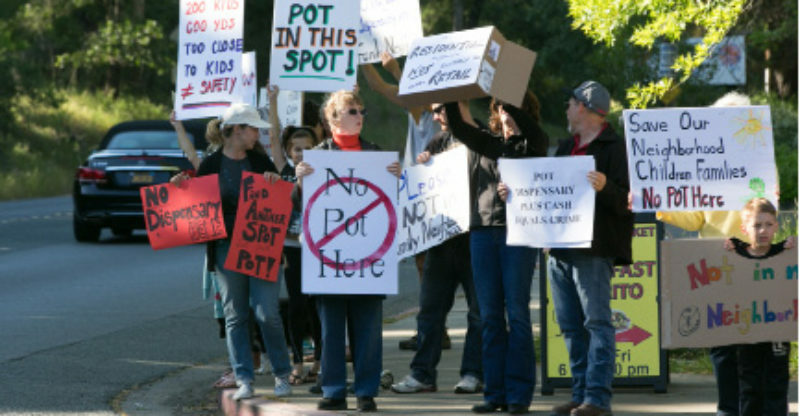 About 20 adults and their children took to the street May 14 with signs and opinions protesting plans to open a cannabis dispensary at the Firehouse Center commercial building near the busy intersection of Arnold Drive and Madrone Road. “No pot here”… “No pot where children play”… “Find another spot”… and “Our neighborhood is not dispensable” were among the signs carried, and many of the grownups present were more than willing to articulate their objections to the Apothevert dispensary, which has been issued a permit pending final county approval. The permit will come before the Sonoma Valley Citizens Advisory Commission on Wednesday, May 23, along with three other permit applications for cannabis businesses in Sonoma Valley – an indoor cultivation permit, an outdoor cultivation permit and another dispensary. Janette Friedman filed the permit application with the county in November to open what she called a “medi-spa” in the Firehouse Center building, where GlobalMed Technologies is currently located. She sought a use permit for a new medical cannabis dispensary with 1,891 square feet of retail floor area in an existing 3,000-square-foot office building zoned for “limited commercial” use. The application has gone through several stages of county review, as have the other three applications on the May 23 agenda. “I am going above and beyond to make sure the neighbors are heard, because they have some concerns,” said Friedman. 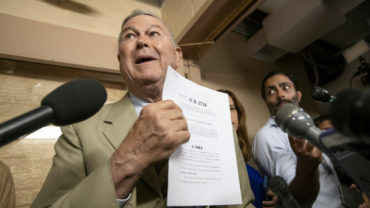 “But they don’t have the facts.” Admittance to the dispensary is through a trained receptionist, and no one under 21 is allowed in unless they have a medical recommendation, in which case the age limit is 18, in accordance with county and state law. The other dispensary up for SVCAC review is to be located at 105 Fremont Drive, near the intersection of Highways 116 and 121, the so-called “Big Bend” intersection. Although there are existing storage buildings on the parcel, the application includes two new 5,000-square-foot buildings, one for the cannabis dispensary, and one for general retail. The names on the application are Haight Street Inc. and Christopher Dunn, of Granite Bay in the Sacramento area; it was filed in July, shortly after the county began accepting applications for cannabis operations. Because of its location, it’s unlikely to evoke the same kind of protests from nearby families concerned about their children’s well-being that the Firehouse cannabis location is experiencing. Applicant Friedman pointed out there’s nothing in the name of the business, or in its logo, to suggest it’s a dispensary; and product is dispensed in sealed, aroma-proof bags, again per regulation. “There’s no chance children will know unless their parents told them,” said Friedman before the demonstration. One of the two grow operations up for Citizens Advisory Commission review includes one indoor and outdoor “specialty cultivation” permit for 50 outdoor plants plus a 500-square-foot garage for indoor grows. It’s a small operation, on a 6.3 acre family parcel on a rural road outside of Glen Ellen. The applicant, former winemaker-grower Mike Benziger, is involved in the Sonoma Valley Cannabis Enthusiasts group, which is hoping to develop a brandable “Sonoma Valley clone” for commercial use. The other cultivation permit is for a cultivation and processing plant near the industrial zone along Eighth Street East, in an existing 10,840-square-foot warehouse with approximately 7,200 square feet for cultivation and approximately 1,100 “processing” (drying and trimming). The warehouse is located near the intersection of East MacArthur. Quinn McGetrick pointed out that it’s been legal to grow marijuana since 1996, when Proposition 215 legalized medicinal use. He said he had a cultivation location in a rural residential zone for years, but when Sonoma passed its own county regulations that excluded rural residential, he had to move. So McGetrick started leasing the Eight Street East building about the time he made his permit application, in August last year. Since then, he says he’s been paying $1,000 a day to hold the space without growing any plants. “It’s hard to find a suitable location – you can’t be very picky,” he said. The next step for all four applicants is next week’s SVCAC meeting, where they will present their case to the seven-member commission and hope for their endorsement. That endorsement is advisory only, and is included in the referral to the county’s Board of Zoning Adjustments, which meets in Santa Rosa – and where public input is most important for contested applications. A version of this story originally appeared on the Sonoma Index-Tribune website. Click on the button below to receive our updates via email.